For most producers, lower input prices are the easiest way to reduce their cost of production. In past posts we’ve evaluated seed prices and fertilizer prices. While recent data indicates lower fertilizer prices are possible in 2016, farmers will likely place pressure on their retail partners to get fertilizer expense even lower. Another option for producers to lower their fertilizer expense is by reducing application rates, especially for soils with banked phosphorous and potassium. This week’s post takes a looks at the data to see if this strategy has been used in the past. Specifically, nitrogen, phosphorous, and potassium application rates for corn have been evaluated. For corn production, nitrogen is a critical input. In figure 1, the national nitrogen application rate from 1964-2010 is shown. These were calculated based on total corn fertilizer usage data from USDA’s ERS and corn acreage data from USDA’s NASS. These rates are averages across all corn producing regions. Farm-level application rates will vary greatly by region depending on crop rotation, soil characteristics, yield levels, and so on. During the 1960’s, nitrogen application rates for corn grew fairly rapidly, expanding from less than 60 pounds of nitrogen per acre in 1967 to more than 120 pounds per acre by 1975. The national application rate peaked at nearly 136 pounds per acre in 1985. Since then, application rates have settled lower to levels near 120 pounds per acre. Even though the trend is steady, there are noticeable deviations from year to year. It’s worth noting the overall decline in nitrogen application rates (per acre) since the early 1990’s coupled with an increasing U.S. average yield (bushels per acre) is often attributed to technological advancements in corn production. This is an interesting topic, but beyond the scope of this post. Figure 1. U.S. Nitrogen Application Rates, 1964 – 2010. Data Sources: USDA’s ERS and USDA’s NASS. To better capture some of the recent variations in nitrogen application rates for corn, the data from figure 1 are shown from 2000 to 2010 in figure 2. Unfortunately, 2010 is the most current these data are available (It would be nice if the USDA had the budget and resources to provide a more current look at these trends). Three data points stand-out. In 2001 and 2009, the national average nitrogen application rates were well below the average application rate of 120 pounds per acre for the period (112 pounds per acre in 2001 and 113 pounds in 2009). These two years represent a 6% decline from average. In 2010, nitrogen application rates surged to 127 pounds per acre. This represents around a 6% increase over the average application rate of the period. Figure 2. U.S. Nitrogen Application Rates, 2000 – 2010. Data Sources: USDA’s ERS and USDA’s NASS. In figure 3, the average application rates of phosphorus and potassium on corn in the U.S. are shown. Similar to nitrogen, an upward trend in application rate during the 1960’s and 1970’s is observed, but since peaking around the 1980’s the average phosphorous and potassium have trended lower. Recently, phosphorus applications are typically around 40 pounds per acre with potassium rates typically around 50 pounds per acre. Figure 3. U.S. Phosphorous and Potassium Application Rates, 1964 – 2010. Data Sources: USDA’s ERS and USDA’s NASS. Since 2000, the most recent data are shown in figure 4. Similar to nitrogen, phosphorus and potassium application rates dropped in 2009. For phosphorus, application in 2009 was nearly 33 pounds per acre, or 22% lower than the period average. Potassium was 34 pounds per acre, or 28% lower than the period average. The fact that phosphorus and potassium application rates dropped more than nitrogen in 2009 is not surprising. This is because phosphorous and potassium can be banked in soil. For fields with ample fertility the single-year application rate could be reduced and the corn crop would utilize the banked nutrients. This can work in the short-run for phosphorous and potassium, but nitrogen does not have this flexibility. While the data are not available, it is worth thinking about the distributions around the application rate decline in 2009. For example, there were likely producers with fields that did not have the fertility levels to allow reduced application rates. On the other hand, there were also producers that reduced their application rates by more than 28% for potassium. These decisions vary by farm and field, but it’s likely that a wide range of application rates were used in 2009. Figure 4. U.S. Phosphorous and Potassium Application Rates, 2000 – 2010. Data Sources: USDA’s ERS and USDA’s NASS. 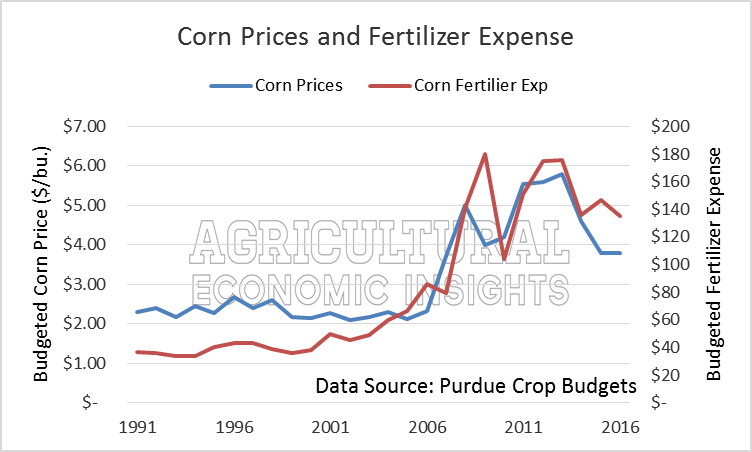 To further understand the application rate reductions in 2009, the Purdue University crop budgets were used to consider the economic conditions. In figure 5, budgeted corn fertilizer expense is evaluated as a share of expected revenue from 1991 to 2016. In 2009, fertilizer expense was budgeted at 28% of expected revenue. These levels, the highest observation in the series, occurred as corn prices fell and fertilizer expense rose (a look at corn prices and fertilizer expense here). For 2016, fertilizer expense accounts for 22% of expected revenue; compared to 23% in 2015. While current levels are lower than 2009, they are the 3rd (2015) and 5th (2016) highest observation in 25 years. For producers getting serious about cost-cutting strategies, reducing their fertilizer application rates can be a short-run option. In recent history, 2009 was a year when producers, as a whole, cut fertilizer application rates on corn. Overall nitrogen rates were reduced less (down 6%) while phosphorus (down 22%) and potassium (down 28%) reductions were considerably more. At the farm level, these price reductions are meaningful. For example, if a producer were to apply 175 pounds of nitrogen with anhydrous ammonia, 70 pounds of phosphorous with DAP, and 70 pounds of potassium with potash, current prices would be $13.37 per acre less than past spring (2015), or nearly 9% lower. The largest driver of this savings comes from the decline in anhydrous ammonia prices. Using the same method we can estimate a potential savings from reducing application rates. Assuming the lower rates from the observations in 2009 (nitrogen application rate down 6%, phosphorous down 22% and potassium down 28%), a similar reeducation at recent price levels would result in nearly $23 per acre in savings, or 15% lower. Of course it’s important to consider the unique farm operation, specific field conditions, and any potential yield-losses associated with a fertilizer rate reduction. Producers, and ag suppliers working with producers, should carefully consider cost saving potential and associated revenue implications. The bottom-line is producers will be looking for ways to reduce their production costs in 2016 and cutting fertilizer rates in corn production has been observed in historic data. Reductions to the magnitude of those observed in 2009, given today’s fertilizer prices, would result in considerable savings for producers.